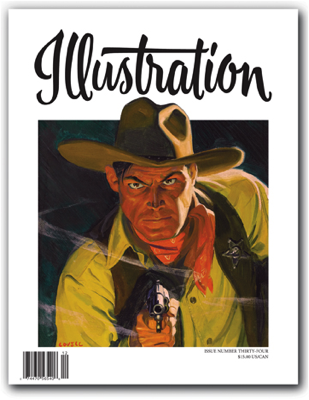 In this Issue: The art of Tom Lovell, who first began his career in the pulps providing drawings for The Shadow, then progressed into the slicks, and finally ended his career as on of the finest artists of the Old West. Our follow-up feature concerns the work of Nino Carbé, a children’s book artist also known for his work with the Disney studios on Fantasia and more. Book reviews, exhibitions and events, and more! 80 pages in full color. Sold out.